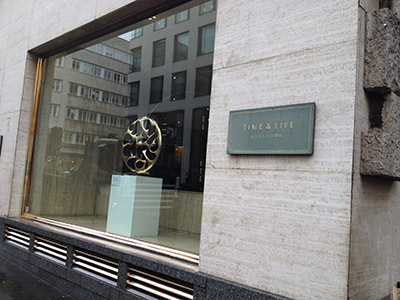 The Time & Life building is a grade II listed building located on the corner of New Bond Street and Bruton Street in Mayfair. 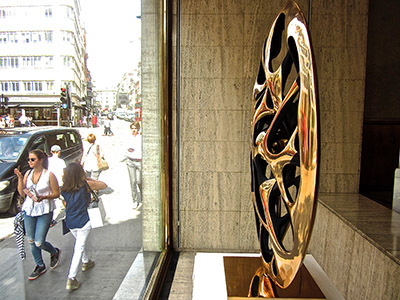 Mounted on the transom above the entrance is a nickel bronze sculpture, 'The Symbol of Community' by Maurice Lambert. 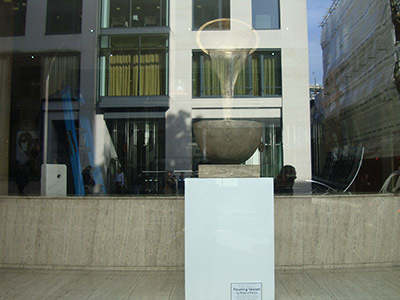 The architect Michael Rosenauer often integrated art into his designs, and there are also four Henry Moore sculptures visible around the terrace. 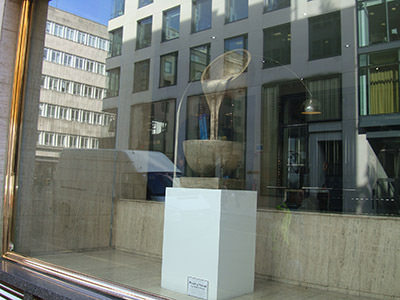 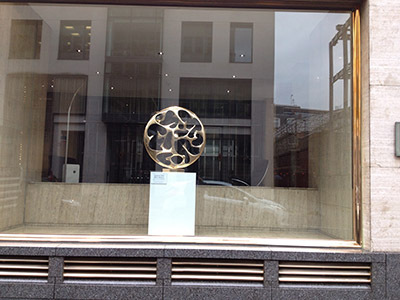 Hay Hill Gallery has previously displayed large-scale sculptures in the main window, including Hand Of God by Auguste Rodin, The Horse Head by Unus Safardiar, several sculptures in the co-operation with arTbridge, and recently (July - December 2014) by invitation of ARTful - Gianfranco Meggiato’s golden Tension Disc With Sphere, and then the Pouring Vessel bronze by Roland Piché. 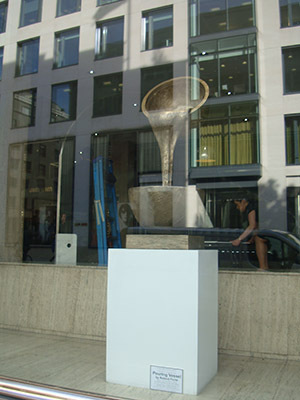 The latter takes inspiration from the artist’s fascination with physics and the meaning of reality, leaving a more specific interpretation up to the passer-by. 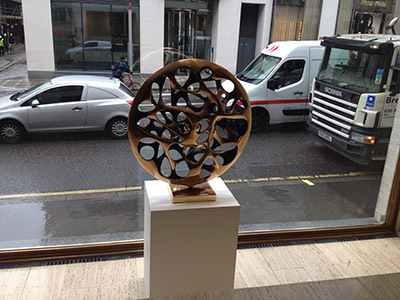 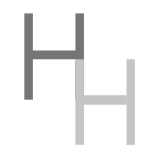 This piece is an optical illusion; perfectly balanced and appearing to defy gravity. 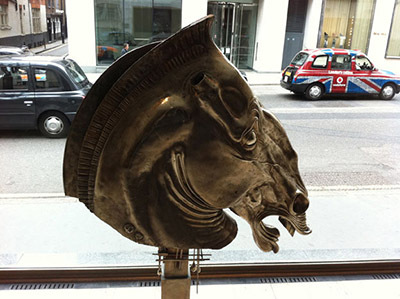 Born in Venice in 1963, Meggiato studied sculpture at the Instituto Statale d’Arte. 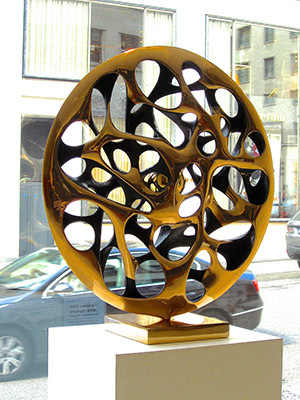 Respected in the European art scene, the artist has also gained worldwide recognition in China, Russia and the USA. 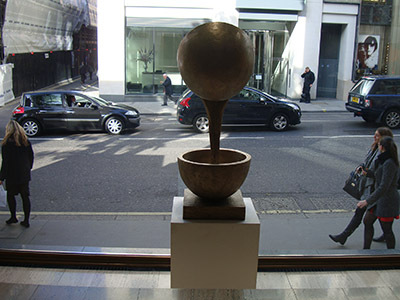 Born in London in 1938, Piché graduated in the early sixties from Hornsey College of Art and the Royal College of Art. 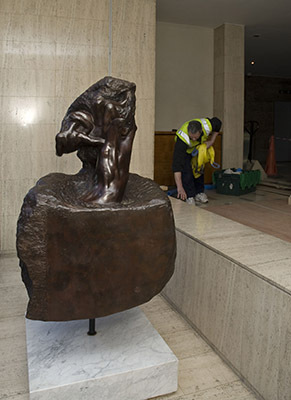 During his eight years of study he was recognised as an independent new voice, supported by Henry Moore whom he worked for part-time.